At about 2 p.m. on the afternoon of March 1, 1944, Chance-Vought (Aircraft) civilian test pilot, Willard B. Boothby, was flying a navy F4U-1 Corsair, (Bu. No. 49882), over western Connecticut when the aircraft developed an on-board fire. Boothby was forced to bail out as the aircraft went down in the Still River section of the town of New Milford, where it struck a private home on Rt. 7 and exploded. The aircraft and home were destroyed, but the home was unoccupied at the time, and there were no injuries on the ground. Meanwhile, the parachute malfunctioned, and the pilot came down in a wooded area on Corman Hill and was killed instantly. At the time of the accident, strong winds were blowing, and police speculated that the lines became tangled. 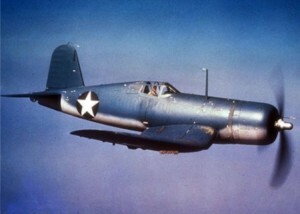 The aircraft had been accepted by the Navy only six days earlier on February 23rd, and was at the Chance-Vought plant for experimental purposes. Mr. Boothby began his flying career while a student at Purdue University, and became a test pilot for Chance-Voight in 1941. He’s buried in Saccarappa Cemetery in Westbrook, Maine. He was survived by his wife and son. Unknown Newspaper, “Willard Boothby, Test Pilot For Chance-Vought, Plane On Fire, Bales Out, And Instantly Killed”, March 2, 1944 – courtesy of the New Milford Public Library. At about 9:00 a.m. on September 11, 1987, a Piper Cherokee crashed in the Gaylordsville section of the town of New Milford. The plane had been en-route from Hyannis, Massachusetts, to Dutchess Co. Airport in upstate New York when the accident occurred. The body of an unidentified man was found in the wreck.